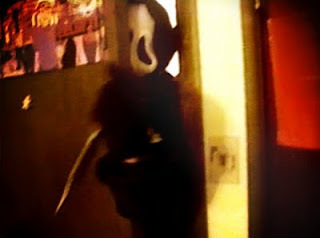 Back in the late 90's/early 2000's we were making a Scream Fan film, among many others. We shot several scenes for it. While I was back in Illinois this past December I came across a bunch of the material on VHS and Hi8. A lot of it is actually pretty decent considering I was only between 13-15 during the entirety of production and the rest of the crew was the same age or younger. We never shot an ending, so I don't have enough material to finish a full cut of the film. So I have compiled a scene here featuring Hilary Honold as Sidney, Caitlin Solomon as Victoria, and Cody Mischler as the stunt man in the costume. The crew this night was Me and my little brother Brandon. This version of the scene was cut around 2000, so it's before I started cutting on a computer. I've now taken that original edit and done some color correction, added a few sound effects, and added Marco Beltrami's score from the original films' soundtrack. I plan to cut more scenes from it as well if my schedule permits. Enjoy! Watch the Scene "Victoria" from Total SCREAM HERE!